PROMOTION DISCLAIMER: Limited time only! Expires Monday, 5/28/18 @ 11:59pm CST. The Memorial Day offer of 15% Off sitewide is exclusive of taxes and shipping charges and will be automatically applied to your shopping cart. 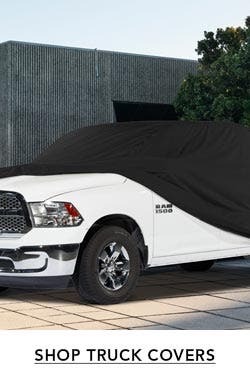 Offer not valid on Covercraft custom vehicle covers. Offer may not be combined with other offers or discounts, may not be applied to Corporate orders or combined with volume discounts, or applied to previous purchases. Offer may be modified or terminated at any time. If you've invested in an outdoor kitchen for your backyard, you'll want to keep it free from dust, dirt, rain, snow, leaves, bugs, rodents, tree sap, bird droppings, and all the other stuff nature brings. 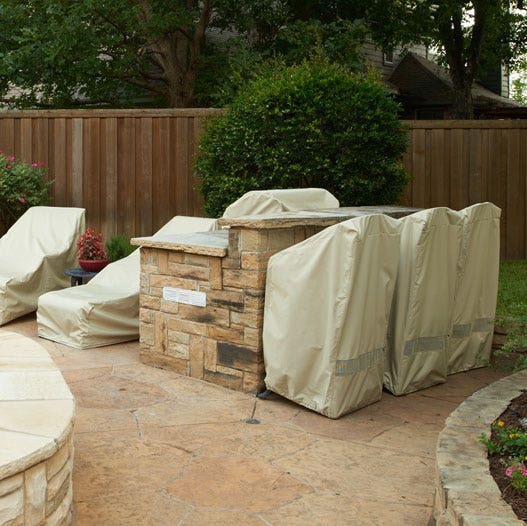 The best way to keep your investment looking its finest year-round is to protect it with our Covermates Elite BBQ Island Grill Covers. Made especially for today's larger cooking surfaces and abundant counter space, these outdoor island grill covers are available in a variety of sizes. Our Elite island grill covers are designed with built-in mesh vents to promote natural evaporation and to prevent the ballooning of the cover on windy days. Along the bottom of the cover is an elastic hem and drawcord to keep the cover in place. 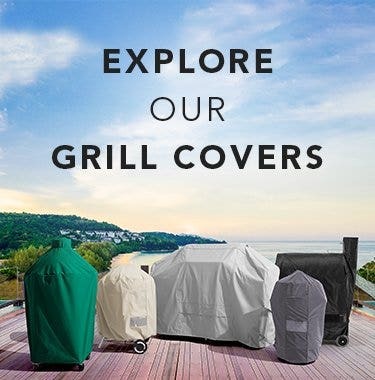 Whether your outdoor kitchen includes a custom built or prefab island grill, our Covermates Elite BBQ Island Grill Covers will keep your cooking area clean and always ready for action! All Coverstore Elite collection of outdoor products purchased from Coverstore are backed by a 3-year warranty. Those listed here are guaranteed to be free from material and craftsmanship defects for a duration of 3 years from the date of purchase. Quickly remove stubborn stains from your cover and keep it looking fresh and clean all year-round.Cleaner works on all water-safe fabrics. 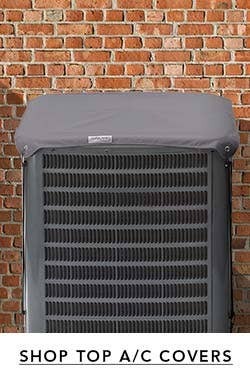 Designed to lock in desired temperatures and minimize exterior condensation. Store and transport all your hot and cold items with our fully-lined waterproof PVC, insulated cooler tote. Now that the exterior of your grill is protected, clean unwanted carbon buildup and oil residue from the interior (and exterior) of your grill with this fast working degreaser formula! Shopping for a business? Check out Coverstore Pro! 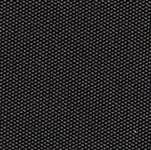 With durable yet lightweight Polyester, the Elite material offers customers the protection they need. Denier is an indicator of the thickness of the threads. The higher the denier, the heavier the material. With 300D fabric, Elite material is lightweight for easy storage and is not too stiff or not too soft for reliable year-round protection. Stock-dyed material is a more efficient way to apply color to fabric fibers before it is spun into yarn. After the dye bath, the material is heated to the required, appropriate temperature for an effective application process.  Though less UV-resistant than solution-dyed material, stock-dyed material can withstand mild to moderate sun exposure. 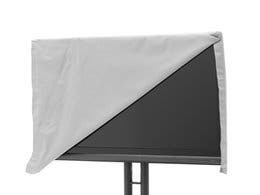 By omitting PVC (polyvinyl chloride, a thermoplastic) backing from our Elite covers, we provide an eco-friendly means of safe yet highly effective water-resistant material with little to no chemical additives. 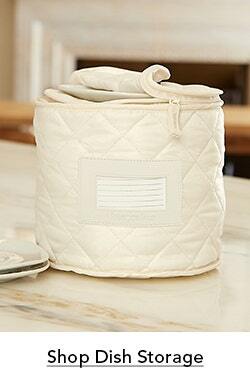 We divide our covers into collections based on a variety of features and qualities. Let us help you find which material best matches your needs. Had a new grill station built over 100 inches wide. Did not know there was a cover big enough until this one . Great material and it fits perfect . Shipped real quick . Cover came very quickly. Happy with the quality of the medium grade cover, fit is perfect. Water did pass through the fabric where it pooled after a heavy rainstorm. Works great to keep the UV away from our outdoor granite. Ordered the tan, wish I had gotten the grey. Great cover, expect many years of use. 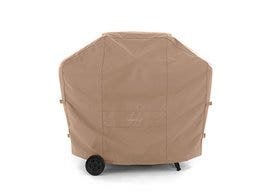 i ordered an island grill covers (item#: 127.bk2) about 1 1/2 months ago from the coverstore. even tho i measured accurately---the cover is way too wide so it does not fit smoothly. not as pleased as i had hoped i would be. 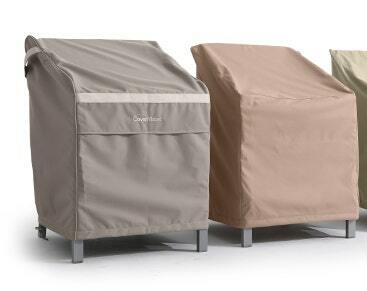 very nice cover for our outdoor kitchen. great quality and fits perfect. I ordered an island grill cover (elite) size 110w x 44d x 48h for $113.99, and it came within a week. I used it the next day to cover my island grill and the material felt like good quality and hopefully, it will last for a long time. my second cover for my island from the cover store. my first lasted 5plus years and worked to perfection. the quality is very good and the fit to measurement is perfect. Great price, quick delivery, fit perfect!! fits great, even though our grill is off center. This cover is exactly what it claims to be, very sturdy fabric and well made. Personally, I wish it was about 12" shorter, so that it doesn't touch the ground so that when you blow out your yard and patio, it doesn't get in the way. I wish that had been an option, but other than that, I love it! Cover worked out great! Excellent quality. Received on time. Thanks for great service. Came on time, easy to put on. We'll see how it holds up to the elements this winter and through the hot summer next year. We received the cover very promptly! I was surprised it shipped the day after I ordered it! Thanks! 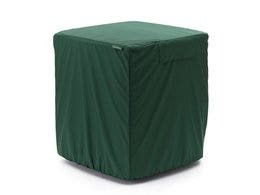 I was unsure about ordering ordering an island BBQ cover online, but the information I solicited from your professionals convinced me that this was the right choice. The cover fit perfectly and the quality was excellent. I'm very very happy with the purchase! Great product! Fits really well. Awesome customer service with very easy return/exchange process. I would not hesitate to order other products. Thank you! Exactly what I needed. Durable cover and fits great. 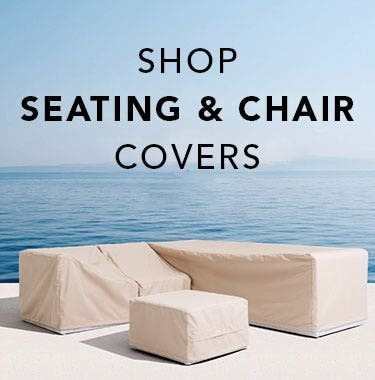 I purchased this cover to actually cover our pool chaise lounge chairs that stack for storage for our pool. I have not yet put it in use but The Cover Store was the only place I was able to find a quality cover in the size I needed at a good price. I feel it will service our needs for years from the quality I see. Thank you! We were extremely happy with the quality of the product and price. Very pleased, would highly recommend. Good quality and fits perfect! 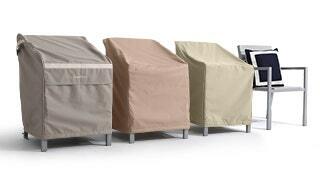 We have purchased several covers for our patio furniture and outdoor kitchen over the past several months. The quality and fit is excellent. We love the light weight -easy to put on, remove and store. Great product and amazing service. I needed to order a larger size and The Cover Store made the process a breeze. Highly recommend this company and product. Product was received very quickly. The product was exactly as described. 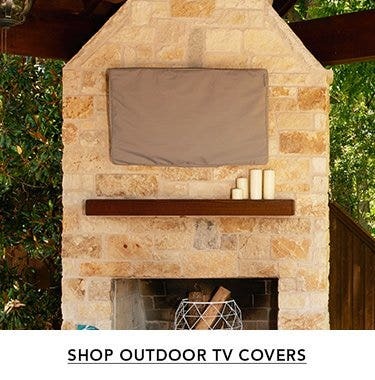 We love this bbq cover. It fits perfect and looks great! Would definitely order from The Cover Store again and recommend to family and friends. works great for our Jenn Aire outdoor barbeque. After Jenn Aire discontinued the cover, weren't able to find an exact match but this cover is sturdy and looks really nice! We have an oddly shaped grill and this cover fitted it nicely. I love the texture and feel that it will hold up better than our last cover did. Excellent quality, great fit, and looks great on our "outdoor living space!" this cover does not disappoint! it is well made and keeps water away from grill. I would recommend this product to anyone. This is an outstanding product. 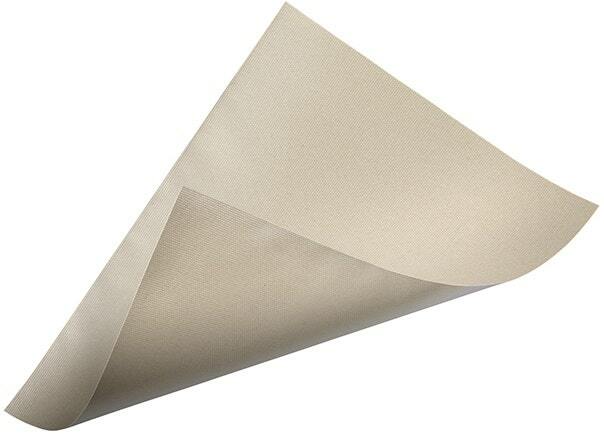 It is well constructed, with sturdy seams and gussets. It fits our needs perfectly. Just as with other items we've purchased from The Cover Store, we're delighted with this purchase. Thank you for subscribing! Your 10% Off code will be emailed to you shortly. © 2019 The Cover Store. All Rights Reserved.